Miami Beach 411 > Hotels > 5-star > Ritz Carlton Hotel in Miami Beach, FL. ¿Hablas Español? ABOVE: A video tour of Ritz Carlton Hotel, hosted by Louis Aguirre. Watch more hotel videos. This page allows you to watch a video, find directions, post a comment, read reviews, and check rates at the Ritz Carlton Hotel. Rates: Low season from $229. High season from $329. The The Ritz Carlton South Beach is place where the genuine care and comfort of the guest is their highest mission. This 5-Star Resort is located directly on the beach. The Hotel is a complete restoration of an original 1953 Morris Lapidus-designed landmark hotel. The full-service property offers deluxe accommodations, restaurants, business center, and a world class spa. All guest rooms have private bath with double vanities and either one king bed or two double beds, in-room safe deposit box, pay movies, remote control color cable television with free HBO; rooms overlooking South Beach and the ocean have a balcony. Wired Internet access (DSL connection) is available in the guest rooms for a charge of $10 per day. • The Ritz Carlton accepts pets for an additional charge of $250 per stay. 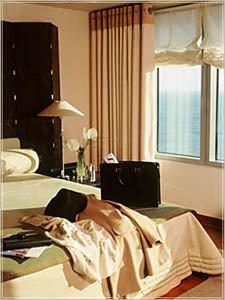 Click HERE for Ritz Carlton Lodging Information. • The Ritz Carlton is on the Right (East) side of the street. Need a limo to the Hotel? Call Miami limo service. 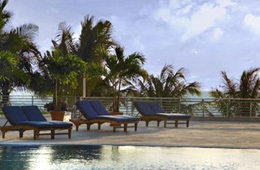 Ritz Carlton is located at 1 Lincoln Rd., Miami Beach, FL 33139. Use our Miami hotel map to find the exact location. Ritz Carlton"This isn't a Ritz Carlton"
I Don't Know what Bill Marriot was thinking when he opened a hotel with a staff so inexperienced. The rooms were stuffy i had an ocen view that was blocked by the entertainment center, which for the price of the room, didn't even have a plasma screen, so i asked to transfer rooms...<smirk> When I Finally got shifted to the "new room" i was astonished to see that the king size bed was wedged into a corner...A King sized bed, in a corner. As if that wasnt enough my wife and i both could not fit in the "2 person" jacuzzi. Mind you I am not over weight and neither is my wife. I had better experiences at a Motel 6. Ritz Carlton in South Beach. Miami hotel reservations.